Embattled Rivers State Governor, Rotimi Amaechi, on Monday said he has steeled himself enough to resist all the maneuverings by the presidency and the top hierarchy of the Peoples Democratic Party to push him out of the ruling party. The National Working Committee of the party had after an emergency meeting on Monday announced the suspension of Mr. Amaechi for contravening “Articles 58 1 (b), (c ), (h) and (m) of the PDP Constitution following his refusal to obey the lawful directive of the Rivers State Executive Committee to rescind his decision dissolving the elected Executive Council of Obiokpor Local Government Area of Rivers State”. The suspension came three days after the PDP and the presidency failed in their bid to dethrone the Rivers state governor from the chairmanship of the Nigeria Governors’ Forum. The governor won a reelection by defeating the presidency/PDP-backed Jonah Jang 19 to 16 votes. In anger the PDP suspended him and raised an 11-member disciplinary committee to try him. But speaking on Monday night, Mr. Amaechi said he would not leave the party for those seeking to oust him. The governor said rather than leave the party, he would remain within the fold to challenge his suspension and victimization with every legitimate weapon at his disposal. The governor described his suspension as a political witch-hunt, saying the party was merely reacting in anger to his reemergence as chairman of the NGF. The governor also said the party was apprehensive about his political future and that it is doing everything possible to bring him down. 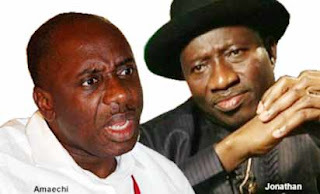 The last few months have been politically stormy for Mr. Amaechi after the presidency and the top brass of the PDP became uncomfortable with him for allegedly opposing party chairman Bamanga Tukur and President Goodluck Jonathan on some important national issues. He is also accused of using his post to strategically position himself as vice-presidential candidate of the party in the coming presidential election.